If any two people discuss their childhood, there's 2 memories that they discover they share. 1) They remember vividly that pinball sequence from Sesame street. (The accompanying words might not help much since they're common to a big chunk of the Sesame Street oeuvre, but they go like this: "1 2 3 4 5, 6 7 8 9 10, 11 12. Na nah na na nah..." Remember? You'd remember it if I sang it. There was a pinball game, and some space ships and color trails and disorientation. A precursor of Liquid Television, and a postcursor of every drug ever invented, it was coincident with a brief explosion of interest in "Fear and Loathing in Las Vegas" among the kindergarten set. 2) They ate Play-Doh. And it was delicious. Play-Doh, as its name suggests, is basically some dough, the delicious building block of bread, cakes, and all that is good. It's essentially the staff of life in fun party colors. Sure, it's a toy, not food. Sure, you were told not to eat it. But trying to keep it out of the mouths of all their charges would have been a full-time job for kindergarten teachers, and punishing offenders would have filled all the corners and time-out spots in the nation, leaving no room for the real lawbreakers: the runners with scissors, the cursers, and the kids who bit each other, a lot. Therefore, the not-eating-Play-Doh rule was essentially a dead letter. The widespread ingestion of their product must have been common knowledge at wherever it was made (Hasbro? Kenner? Parker Brothers? Did Parker brothers make toys? I think it was Hasbro). Naturally, action had to be taken. Play-Doh must be made to taste less like food. But how? 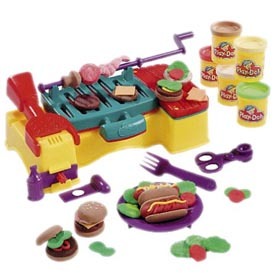 Innocent of the evil they do, the makers of Play-Doh make a food-themed Play-Doh play set. Finally, Hasbro(?) decided to add salt. Bravo, gentlemen! Nothing like the world's most popular spice to stop all that eatin', once and for all. I imagine the decisive meeting went like this. CEO: What can we do to stop people from eating Play-Doh? IDEA GUY 1: Let's add poison! CEO: We can't. Every child in America will die. IDEA GUY 2: What if we added salt to make it inedible? IDEA GUY 1: Brilliant! Witness the failure of America's least favorite snack food, the pretzel. CEO: What else can we add to make it even less appetizing? IDEA GUY 2: Raspberry preserves! IDEA GUY 1: What if we served it with some duck confit in crispy phyllo served with house preserved quince and Foie Gras cream sauce? IDEA GUY 2: And a choice of red or white wine? IDEA GUY 1: And truffles! The above play may be what they WANT us to think happened, but I don't believe it for a minute. If Hasbro(?) was run by such fools as that, how would they ever thought of such brilliant toys as My Little Sharpened Spring and Teddy Fascist Ruxpin? (The "Roosevelt Cross-Examined" tape is still a classic of the genre.) The fact that Play-Doh is a triumph of the confectioner's art is no accident. In my opinion, it's part of a marketing scheme which other companies haven't fully adopted--YET. It's a technique I call "Planned Eat-Selescence." 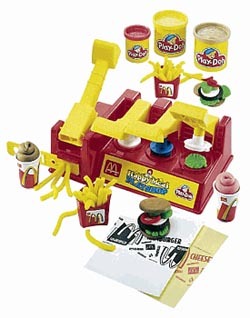 Play-Doh McDonaldland Set. I find you GUILTY, gentlemen! The Child-Proof Edi-bottle: The kids will never get the lid off this bottle... UNLESS THEY EAT IT! The Sticky: A sensible family sedan made of spun sugar. MASH 2001: A stable, user-friendly operating system made of mashed potatoes. And, of course, in the future, this website will be composed entirely of Wheat Thins. In the words of Mel Foodus, the lead marketing manager of L&E Corp, "I have seen the future of comedy, and it is delicious."